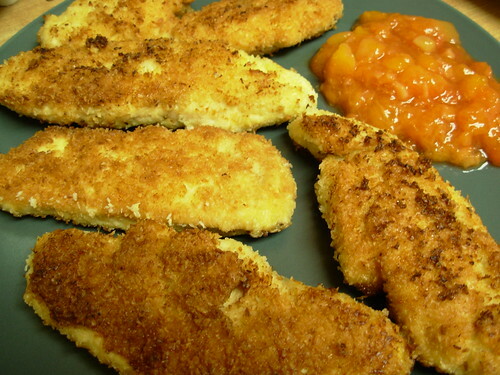 One of the foods my husband and I really miss on the paleo or primal diet is breaded chicken. It's just soul satisfying comfort food for both of us. I do make a gluten free, grain free version of chicken fingers with almond flour sometimes, but tonight I thought I'd try something different. Keeping with the coconut theme I've had lately, I decided to dredge the chicken in unsweetened dried shredded coconut. I didn't want them to be naked, so I wanted to make a sauce, but pan sauce or gravy didn't seem right - so I decided to make a spicy fruit chutney. The result is a tropical dish that's just right for these hot summer evenings! Set up a dredging station with 3 bowls, one for coconut flour, one for egg, one for shredded coconut. Season the coconut flour with the salt. Dredge each chicken finger first in coconut flour, then egg, then shredded coconut. Heat a bunch of coconut oil in a large heavy bottomed skillet over medium/medium-high heat. Cook the chicken fingers until golden brown on each side. Do it in more than one batch if necessary and keep cooked chicken fingers warm on a foil lined baking sheet in an oven set to the lowest setting. Mix everything together in a small saucepan. Bring to a boil, lower heat, and simmer uncovered for 30 minutes until thick. Discard dried chilis and cinnamon stick. Can be eaten warm or cold. Recipe adapted from The Garden of Eating. Ah Elizabeth! Your food always looks so amazing!!!! Yummy!! This sounds great. I have been on a coconut kick lately too. The chciken looks so good! Would dried shredded coconut work? Yummy Gatherer - Hehe, thanks! Coconut is pretty awesome. This looks amazing! Thank you for posting it. I can't wait to try it this week! Thanks for the idea. I miss chicken fingers as well. The almond and coconut alternatives are great!! I will definitely try this one, thank you! Wow this looks amazing. I can't wait to try it tonight! I am always looking for a way to vary my dinners when I make it for my boyfriend so he doesn't get bored with my cooking. I always try and keep it healthy though so thanks for the variety! So, I am going from vegan to caveman and tried these. Fabulous! Holey moley that looks utterly gorgeous! I will definitely be cooking this this weekend, that you so much for sharing. I think it would be a lovely coating for prawns (shrimp) too. I followed the instructions, it was not good. I would suggest ONLY doing one batch per bottle of coconut oil and pre-breading. Im in MN so I'm great at frying walleye. Also, the oil doesn't cook right. I sliced the chicken very thin and it still wasn't cooked all the way. I had to finish cooking in the oven. Can I nix the wine? I don't drink and don't really want to buy a bottle.